Australian local government is in the midst of a reinvention and re-imagination of its place and role in local communities. That is as articulated by the recently released Australian Smart Communities Association (ASCA)report — ‘Re-imagining the Local Government Operation Model’. Added to that, trust in Government (not just local) is at an all time low and if last weeks Liberal party leadership spill in Australia is anything to go by, it’s not getting better anytime soon. As ASCA states, Australia is now in the bottom third of the countries surveyed in the 2018 Elderman Trust Barrometer. 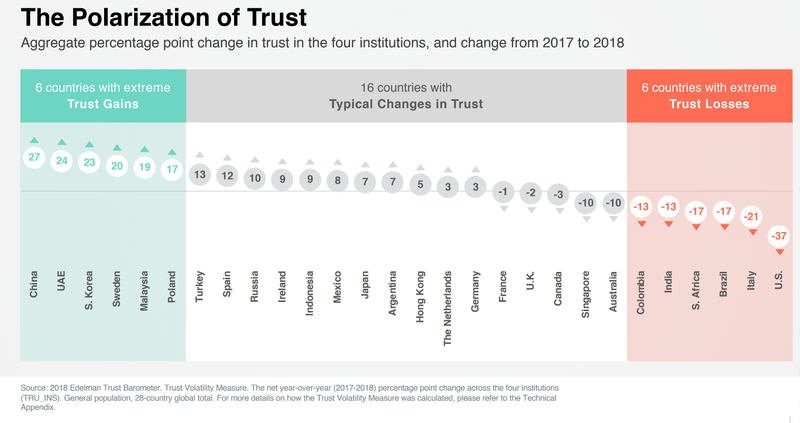 In fact, looking at the infographic below shows that Australia is not performing well at all just one spot out of being a country with “extreme trust losses” just ahead of Columbia, India and Africa. The current model of Australian local government operations takes a top down approach to decision making, prohibits collaboration and does not utlise the full scope of data available to us. This comes at little surprise, with the development of this model taking place nearly 100 years ago. However it is now outdated due to the technological advancements and philosophical changes in our society. The digitally connected citizens now wants and demands more especially when it comes to how their local communities and cities look and work. As the ASCA report found, citizens want to live in community that is collaborative, participatory and “one that takes data from many sources, including sensors, residents, and partner organizations, and organises it in a way that enhances the user’s experience”. This sentiment was also reflected in a recent University of Melbourne’s Next Generation Engagement: Informing community engagement for Australia’s infrastructure sector — Research Priorities Summary. The report, self described as Australia’s “largest national study into community engagement in infrastructure to date”, finds that “communities want detailed answers on infrastructure”. Digitally connected citizens aren’t prepared to just‘engage’ and share their thoughts and ideas on planning and infrastructure development issues at drop in sessions, community hubs or surveys at a time specified by the developer or local government authority. Instead, with busy lives they are taking to social media to converse and share their views on concept design and design options with other local residents. With this in mind the info-graphic below is not surprising. 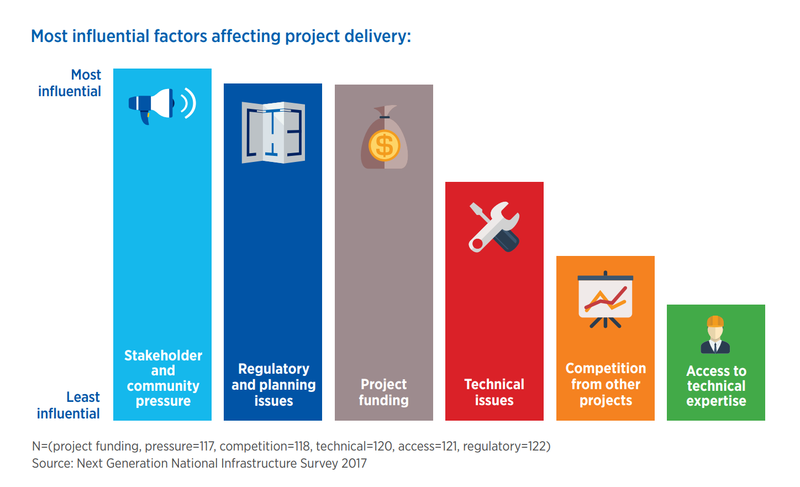 It illustrates findings from the Next Generation National Infrastructure Survey that ‘stakeholder and community pressure’ is seen as the most influential contributor to infrastructure project delays or cancellations. Time for a ‘co-design then decide’ approach in infrastructure development? How can community engagement in infrastructure be done differently? Done better? Perhaps, it is about moving from a ‘decide and defend approach’ in infrastructure development to a ‘co-design and decide’ approach? Snobal’s AI assisted VR software was created with the vision of ‘democratizing design’ through enabling complex built environments, including infrastructure development, to be designed with end users (the community, business and key stakeholders) not just for them. To enable an inclusive design process and, in addition to make existing ‘hidden’ qualitative data, visible and quantifiable. ==enable end users help solve design challenges through helping to identify criteria by which to evaluate designs. ==enable end users articulate and share their responses to ‘open ended questions’ on places of value in the virtual environment. Qs such as what they feel is special about the community or specific environment; how they might like this articulated in any design and other issues they feel need to be considered in any redevelopment. ==track and report on all user interactions in the virtual environment including what the user looks at, what they interact with, how long for, what comments they are leaving in what places in the virtual environment. The ASCA report on re-imagining the local government model, writes of the three elements of a smart community — smart capacity, smart infrastructure and smart innovation. We’d like to add one more — smart collaboration. Using emerged technologies, such as AI and VR, to co-design and collaborate with end users on how their cities should look and operate. You could call it Human Centered Infrastructure Design. Would love to hear your thoughts on how we can best use digital and emerging technologies to design, build and create compelling built environments.